The Fête de la Musique is coming to the City of Winds for a feast of wonderful music. The music festival, also known as World Music Day, will be launch in Baku on June 21, Trend Life reported. The great festival uniting both amateur and professional musicians promises to act as an excellent platform for the expression of all styles of music. 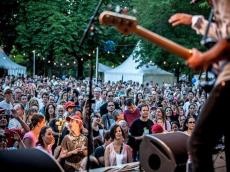 This music event is traditionally organized in the summer months, filling crowd streets, parks and different public places with joy and festivity. On Music Day the citizens of a city or country in particular play music outside in their neighborhoods or in public spaces and parks. This festival will go on the squares of Baku and Inner City, Fountain Square and Nizami Street. The event is co-organized by the Embassy of France and the French Institute in Azerbaijan, the Ministry of Culture of Azerbaijan, the State Tourism Agency, the Administration of the State Historical and Architectural Reserve Icherisheher, the Space of Contemporary Art YARAT, Street Food Festival and Maks Events. The Fête de la Musique was launched on June 21, 1982, the day of the summer solstice, where the night is the shortest. World Music Day is now held in over 450 cities involving 100 countries around the world. The festival aims to expose as many people to music as possible. Many free concerts are organized, making all genres of music accessible to the public.